Out of the vast array of parts and accessories available for our machines, one that’s high on the list for proud owners is aftermarket motorcycle levers. Particularly shorter ones. Given the more outlandish designs and colours of these levers, you’d be forgiven for thinking that they have merely been designed to add to the style of your motorcycle and nothing else. However, even though a large portion of a rider’s decision to get aftermarket levers will be an aesthetic one, there are actually some benefits (even if they are slight) to them that you may want to know of if you ever plan on changing out your clutch and/or brake levers. After we’ve taken a quick look at the benefits, we’ll also cover some of the best options available to you. For those that only use a couple of fingers to use the clutch and/or brake, they will find short levers more comfortable than stock ones. The extra adjustment range available is going to make it easier for the rider to set the levers up and get a better position for them. As you’ll see below some aftermarket motorcycle levers offer greater adjustment than others, but generally they all offer more than what stock levers do. This is going to be a more prominent benefit in short levers given the clearance they have to the end of the handlebar, but even the long aftermarket levers will fare better than stock. The design will play a part, allowing the lever to fold right back on itself to help stop it snapping, as will the material itself. Ok I said this in the beginning, but in the right colour aftermarket levers can really set off the front end of the bike, and the design itself simply has it looking more ‘trick’ than it does with stock levers. It is said that with shorter levers you are getting less leverage, and while from a theoretical viewpoint this is true, from a practical one it’s not so much. If like me you only use two fingers to brake, it means that your fingers are going to be a little way up the stock lever and not on the very end of it. Even with a short lever your fingers are still going to be the same distance away from the pivot point of the lever, resulting in no lost leverage. So really it should be said that you are losing leverage potential, but this may not affect you personally depending on how you operate the levers. This will be down to personal preference. I prefer a shorter brake lever because I only use two fingers to brake, but on the clutch side I have a long one simply because I use all four fingers to pull the clutch in and a short lever would make this difficult. Consider how you ride before making a decision on which size to go for. One of the standout options recommend on any forum when the question of which brand to buy is asked. They have a great finish to them and in my opinion have the best design. They also have the finest available adjustment out of the options here, allowing you to more precisely find your ideal position. The downside is they are the most expensive here by quite a margin. Another very popular brand among the motorcycle community, and a product that still offers a good deal of adjustability compared to stock. 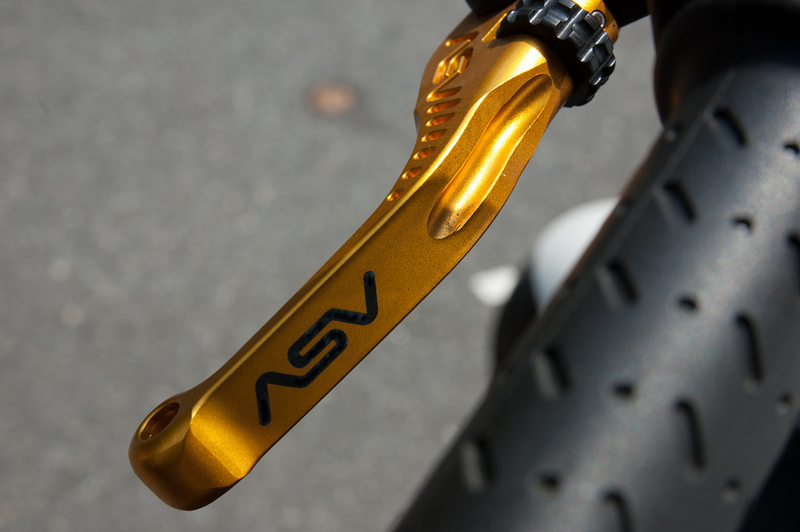 They are somewhat cheaper than the ASV levers, but given that Pazzo Racing’s whole business is their levers, the quality of their product is what defines their success. Given the growth they have had in the 3 years they have been producing them (though they have 25 years of machining experience) it’s safe to say that they are putting out one quality product. There is a raft of Chinese copies that can be found on eBay, and while I would always be hesitant about such things, largely the feedback people are giving is positive, with many riders claiming thousands of miles of use with no problems. It is said that from an operational standpoint you really won’t notice a difference, but it is the fitting and finish where the drawbacks will be found. The anodizing is said to wear off quite quickly so the colour fades, and there have also been reports of being difficult to fit due to the paint being too thick, or bushes being different or missing. With products like this you should always take a cautious approach because the quality control during manufacture simply won’t be to the same standard as proper branded products. However, given that some levers can be found almost ten times cheaper and essentially do the same thing, it’s tough to not even consider them at all. Just know what you’re potentially getting into if that’s what you end up opting for. As I said up top, a large part of the decision to go for aftermarket motorcycle levers will be down to aesthetics, and if opting for a branded product, it’s a lot of money just to make your bike look better. But don’t think of it as money wasted. As with rearsets, comfort in the operation of your motorcycle is a big thing, especially on the track, so don’t disregard them as purely for show. The added benefit of having a greater chance of holding up in a crash should also be considered, especially if you’re one for throwing it up the road more than most. In the end, while they are not a necessity by any means, they do make a great addition to any bike and many riders will tell you they couldn’t do without them now.